Well, most of last week was devoted to prepare my husband’s birthday party on Saturday. We started buying groceries on Wednesday, and just before we went out of the house I decided to check my e-mail, and – my computer froze on me and went dead. I tried to remain calm, did not frantically try to get it working again but instead went out with my husband to get vegetables, meat, and wine. After we came back I switched my dead Macbook for my eight year old eMac, and hoped that I could use that for teaching. What a good thing that I had made a backup just days ago. The only thing that would have been gone forever where 1,000 words of the story I’m currently writing. Wednesday was also the day my new notebook arrived. I absolutely love it. I have been tip-toeing around it for about a year now, thinking that I’d make one myself but it never happened. I even bought a poor substitute that I never was happy with, and that destroyed the lining in my favorite handbag with its sharp edges. I always carry a notebook, and I love that this can hold regular sized notebooks as well as loose sheets of paper. Friday we did a little cleaning, then there was a great amount of teaching (as most days but that Friday was near insane). I was totally flustered because of both the looming party, and the fact that every single lesson brought up something that I needed on my computer. Also the eMac doesn’t work with my iPods. Or with any of my student’s. I started spending my free moments looking longingly at new computers. And I found that the new Macbook doesn’t come with a Firewire connection. Which I desperately need for my audio stuff. In the afternoon one of my students suggested something for my computer that didn’t work but it brought me to a point where I googled “Macbook grey screen beeping” and found out that my problem was not a dead computer but faulty RAM. Bingo! I still had some RAM in a drawer because when I bought the computer I had immediately upgraded. And once I switched that for the old one the computer was working again. Phew! I immediately did a backup of everything. My husband and I spent the rest of the evening preparing onions, ginger, and seasonings for next days party. And we rehearsed the Bach piece he had wanted to play for our guests. Through rehearsing we found out that the piano had de-tuned itself over the past two weeks. My poor husband had to try and match his violin to a piano that produced several pitches at once. 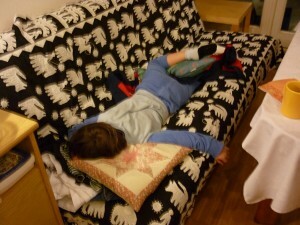 Our son spent the night at his grandmother’s place, very helpful. Saturday was spent cutting, and stirring, and seasoning, and cooking, and baking. In the end I barely made it into my “party clothes” and make-up, and I was really, really happy that I had insisted on setting the tables first. Which meant carrying the tables, and chairs, and plates, and glasses, and silverware down from my mother-in-laws apartment, before setting everything up. My mother would have been proud, I even had matching paper napkins. We made Samosas, Pakoras, Naan bread, Lamb stew, fish curry, Dal, Almond Chicken, and mango creme. Doesn’t sound that much work, doesn’t it? Only we made everything from scratch, and somehow it took about nine hours to prepare everything. With the added bonus that all the dishes had to be ready at the same time, of course. I’m so not going into catering. 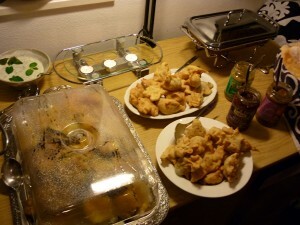 The party itself was very nice, only I didn’t enjoy it that much, I was just too tired. Our son managed to sprain his ankle for the second time that day, claiming that he had broken it. Well, it wasn’t broken but it wasn’t fully functional either. The party went on until three in the morning when my husband’s brother left. That conversation with him between one and three was the highlight of the day for me. The next morning after about five hours of sleep we started cleaning and putting everything away. That went on for the whole day as well. In between we had an argument with our son who wanted to attend a birthday party despite his sprained ankle. In the end we caved in, and I took my mother-in-laws car to drive him over to that indoor playground about fifteen minutes from here. (And still I don’t know why it’s reasonable to have a birthday party where every single child gets carted around by his parents. I would have had to spend one hour in the car to get him there and back.) When we arrived at the playground thing and I got out of the car it smelled somewhat funny but I didn’t think about it. I got my son to the party, and left to go home. After some time the car started to behave in a weird way. Well, I barely got home and when I did the car stank and a woman passing on the sidewalk said, “Is your hand brake on? Haha.” Haha, very funny. At first I felt very dumb for not realizing that I had forgotten the hand brake but then I thought again, how I always check it at every single light I pass. Well, it seems that years and years of putting the car in a closed garage that’s not really ventilated might cause your hand brake to rust so that it can’t be disengaged anymore. Fun. Now how to get my child back from the birthday party? My child that could barely walk? Before researching public transportation I remembered that there was one other mother that I recognized, and I had her phone number. I was lucky because she was home, and she agreed to take my son with her. Phew. Monday was a quiet day, and we started to relax. Only the annex seemed to get a little cold. We didn’t think much of it and went our merry ways. On Tuesday it was clear that something with the heating was not right. But it was only the annex, not the main house. (This always sounds like we’re living in a mansion but we have a very small, very old house to which we built a three-room-annex for teaching.) So we decided to call the furnace guy the next day. Well, we didn’t take that all that well. That evening I declared that from now on he was to sleep in his bed all night long, no exceptions. (As I explained in my last post we have a contract now, and this has resulted in him falling asleep in his bed but still every night he came over to sleep in the sleeping bag on the floor.) I had told him this but still he was very surprised when at 5 in the morning there was no sleeping bag in my bedroom for him. I told him to go back to his room and stay there. He cried, he started to bargain, but I had none of it, he had to stay. (By the way, he didn’t even mentioned being afraid that night. Seems like his fear was a convenient tool.) The rest of the night was somewhat unrestful, I had to put him back to his bed every 30 minutes or so but his protests became softer and softer. The next day I realized that a) I had to find a way to get to the health food store without a car, and b) if I didn’t get to the big city that day the next time I could would be a week from now. So I left in a hurry while my husband phoned the furnace repair people. I went to the big city and ordered my new piano, something that would merit its own post if my life weren’t so full at the moment. We had realized that it would take us ages to save enough money for the piano, and that our regular expenses had gone down (no more daycare fee and one mortgage paid off). So I went in and ordered my new, shiny, black piano, and it’ll get here in two weeks or so. Before leaving I received my very first shipment of the Rockin Sock Club, something really exciting but I didn’t have time to open the package yet. When I came back from my adventures in the city, laden with groceries and very hungry the furnace guy arrived and I spent the next thirty minutes helping him decipher the manual for the part of the furnace that controls the annex. Then my husband came to tell me that I had exactly ten minutes left to eat lunch before my first student arrived. (Then he spent the next hour or so helping the furnace guy who then phoned his boss who came also in.) For now we have heat in the annex again, and there will be a new part to be put in in a couple of days. Then I taught for the rest of the day, spent the evening knitting for the first time in days, and fell asleep like a stone. I was waken by my son at 2 a.m. clutching his pillow, a blanket, and a big bag of stuffed animals but I sent him back to his room, and he didn’t even cry! Today my husband decided to try the car again, and came back saying it went fine, nothing wrong with it. So I took it to buy groceries and get the beer cases from the party back to the store. The car acted a bit weird when I left the garage, and once I went down the street there was this “wup wup”-noise coming from the tire back right as if I had a flat. I turned around immediately and drove home again. Of course my husband thought I’d gone all female on him but when he checked the car again he barely got back into the garage after moving it for about three meters back and forth. So the car is clearly broken. Fortunately this is mostly my mother-in-laws problem since it’s her car but since we all use it we’ll pay half of the repair. Unless it’s very expensive which will mean it won’t be worth it. We already decided that we won’t buy a new car again. We’ll see. So now I hope that the next week will be a little quieter. Tomorrow I’ll see my son’s teacher, some time the next week we’ll get our heating in order again, and then I’ll get my new piano, and then we’ll have “winter break” for a week. How are your lives going? Exciting as well? Oh, and by the way I have a piano to sell. It’s walnut, about thirty years old, and just had a complete overhaul.